Lamberto Maggiorani plays Antonio, an unemployed man who finds a coveted job that requires a bicycle. When it is stolen on his first day of work, Antonio and his young son Bruno (Enzo Staiola) begin a frantic search, learning valuable lessons along the way. 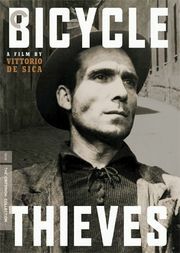 The movie focuses on both the relationship between the father and the son and the larger framework of poverty and unemployment in postwar Italy.